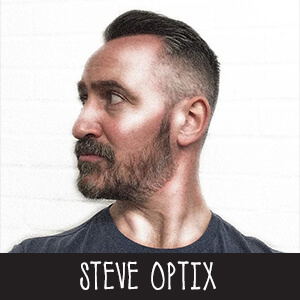 Steve Optix has been spinning vinyl since ‘93 in the UK and abroad, transcending genres from electro to acid to disco to trip hop, techno and breaks. He started spinning vinyl twenty five years ago but hung up the headphones for a while to raise his family, but the turntables have been back out the last couple of years and demand is growing again for Steve’s eclectic, unique vibe. Over the years Steve’s guested at many spots and held a number of residencies as well as running Spectrum FM in the 90’s and self promoting many nights. Currently regularly spinning vinyl in and around London and his own Vinyl Lab night, Steve’s influences span far and wide, from Dave Clarke to LTJ Bukem to Vangelis to Cantoma to Slam and back again! Regularly asked ‘what sort of music do you play?’ he sums it up in four words – Eclectic, Disco, Balearic, Edits!